While reading Open by Andre Agassi I couldn’t help but see how clearly his life-long struggles so closely tie to the meaning behind our chakras (energy centers within our body). In fact, while reading his story I also devoured Truth Heals by Deborah King, which clearly depicts for us how the answers to almost every challenge or illness we have in our lives can be revealed for us within our chakras. A chakra is believed to be a center of activity that receives, assimilates, and expresses life force energy. Chakras are energy centers along the spine located at major branchings of the human nervous system, beginning at the base of the spinal column and moving upward to the top of the skull, through which pass 3 major energy channels. Chakras are considered to be a point or nexus of biophysical energy or prana of the human body. Prana is the basic component of your subtle body, your energy field, and the entire chakra system…the key to life and source of energy in the universe. It is the six major chakras that correlate with basic states of consciousness. Each chakra in your spinal column is believed to influence or even govern bodily functions near its region of the spine. Because autopsies do not reveal chakras, most people think they are a fancy of fertile imagination. Yet their existence is well documented in the traditions of the far east. For the sake of this post, let’s leave the definition at this. I do encourage those of you who are interested in reading more about chakras to visit this link and simply enter “chakras” into the book search category: http://bit.ly/9EuwlC. 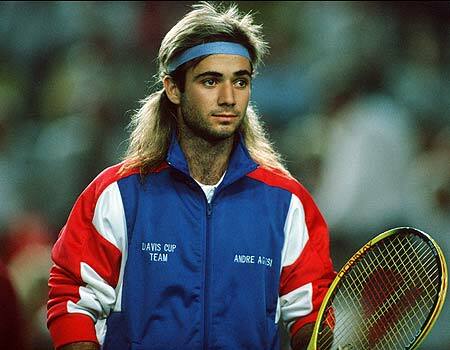 Now, back to Andre Agassi and Open. The book is all about his life, and in general, his complete lack of control over his childhood, adolescence, and career. About coming to his TRUTH and authenticity later in life. A dramatic part in the book is when Agassi essentially lies to the world about his “rocker” and rebellious hairdo, which essentially is a wig. At a very young age he is trying to come to terms with losing his hair. It’s a part of the cover up of his whole life. According to Agassi he “hates tennis.” Can you imagine that? If that’s the case, where and what is his TRUTH? You’re not being completely truthful. You’re angry; you can’t be who you are. You may look polished and put together, but you feel like a scared child inside. SOLUTION: be authentic. When you can trust yourself to be truthful on the pages of your journal, you can trust yourself to be truthful in the world. Just watch how your whole body relaxes as you express your truth. You’ve given yourself permission to be you—to speak your mind, to give voice to the truth of who you are. Agassi has done this in Open. A first and HUGE step toward energizing his 5th chakra and healing. You lack higher wisdom for guidance and have no signs that you are on the right path. You’re not tapped in to your internal messages regarding purpose and direction nor visualizing positive or peaceful outcomes. You’re not putting self-interest aside and instead embracing the greater good for all. SOLUTION: Expressing the truth about who we are and what we really want is the key to peace and healthy living. Listening to ourselves and acknowledging what we really feel allows us to change what is not working and to live in a more meaningful, purposeful way. The brain is the center of rational thought, the Intellectual center. In both Homer and Plato the psuche (or genos) is considered the immortal part of the Soul. The physical substance corresponding to psuche was marrow (medulla), especially the cerebrospinal fluid of the brain and spine, but also in other parts of the body. Scalp and facial hair were considered physical emanations of the psuche, and so the hair, scalp and chin were considered sacred. This center corresponds to Chakra 6 (at the brow), called Ajna, which means “authority or command,” an appropriate name for the rational faculty, which Plato said “controls and restrains” the lower faculties; Onians calls it the Executive function. Can you see how his loss of hair can be attributed to his feeling that he had no authority or command over his life, or that he had no control or restraint, hence his “rebel” image and actions? Quite extraordinary. I’m not nearly finished with Agassi’s powerful autobiography, but what I know for sure so far is that he has healed; that writing Open was his “journal”… his pouring out of frustration and a work of art with which to finally reveal his authentic self. I highly recommend his book. In general, healthy chakras are ones that are balanced and not blocked. With practice and awareness we can identify which ones may be blocked and begin to do the work that is necessary to bring them back in balance. For this knowledge, Deborah King’s book, Truth Heals, is excellent. Here is the link to find it: http://bit.ly/fdKnu3.